Published: June 20, 2013 at 12:01 p.m. Updated: June 20, 2013 at 01:01 p.m.
Green Bay Packers head coach Mike McCarthy repeatedly has promised in "Big Letters" that the Packers' running game will be better this year. So far, the team has shifted the offensive line dramatically and tried to re-build depth up front on defense. Those changes all indicate a desire to improve the Packers' toughness, but McCarthy said criticism about last year's team's toughness has been woefully misplaced. 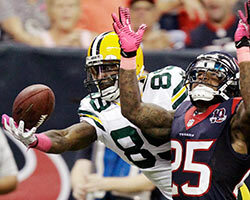 Take a look at the best photos from the Green Bay Packersâ 2012 season. "I think it's a load of nonsense because I think the proof is in the pudding. If you watch the tape and the film and you win 12 games a year and you don't win the Super Bowl, people have to question something. I get that," McCarthy told the Milwaukee Journal Sentinel. "That was the line that some people took and hey, when you play good football teams week in and week out, you're always looking for a hole in your opponent. And sometimes when people don't see too many holes, the easiest and biggest target to go after is a man's will. His toughness." Perhaps this is just a matter of semantics. The Packers running game needs to be more effective, not tougher. Their defense needs to fight off blocks and stop the run. But controlling the running game is what gets labeled "toughness" in the NFL. "And that's the beauty of our game," McCarthy said. "Your will and your toughness are challenged every day. So to ever label an NFL football team as not being tough? I mean, there are some teams that are tougher than others. Most teams think they're tougher than everybody else. That's part of the DNA of our sport. But I'm very, very confident in the toughness of our team. McCarthy, who hails from Pittsburgh, exudes toughness in his personal approach. He knows that you don't need to run the ball 30 times a game to be "tough." You just need to be more explosive when you do decide to run.